Why has this happened? Why me? Why did I deserve this? Did I seem an easy target? Did he ever love me? 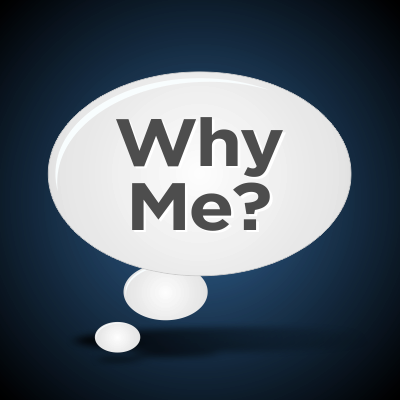 Feeling this way, and asking the question “why?” and seeking the answer for this, is a normal human reaction. What you have experienced is not normal. It is not what we are told is normal to expect from a relationship. Often, we didn’t know that people like this existed. I honestly believed that only children told lies. I knew that adults lied about small things, everybody tells white lies, but I didn’t understand or fully comprehend that adults lied. Not just small lies, but massive outrageous lies. This can make you question yourself. You can question what is real, and what is not.You can become desperate for answers to the question why? Often the relationship with the sociopath ended suddenly and without warning. Because the sociopath is manipulator and deceptive, he would have been planning his escape, behind your back, long before you were aware. It is only after the relationship has ended, that the truth begins to emerge. It is not always this way, but a sociopath rarely admits when he has done something and so even if you suspected that he was cheating, or that he was planning his escape behind your back, he would have denied it, and likely accused you of making a fuss, and causing a scene. He would have told you that you were being crazy. This is classic sociopathic deception. The sociopath has the ability to leave the relationship, empty without closure. Sometimes this is so that they can return, if it suits them to do so, but always it will be because he doesn’t really think about how you are feeling, and your welfare. He doesn’t see how he has a responsibility to give you answers. You could be left begging for answers. Trawling the internet trying to seek the answer to ‘why’ to fully understand. It isn’t that you are stupid or weak to have believed in him. You need to remember that he is the master manipulator and would have played a role tailor made to seduce YOU. He would have assessed your needs and wants, and then became your ‘perfect man’ to lure you in. It isn’t that he has lied and deceived only you.He has done this before, and he will go on to do the same to the next person, and the one after, just as he has in previous relationships. If he has cheated, and gone off with someone else, she isn’t better than you, as he will do the same to her too. Sociopaths get bored easily. The need a challenge. As they have little else in life. Sometimes in life, it can be difficult to see why? This can be difficult, when you are stuck in confusion. Right now you need answers, only answers will end the confusion. And you will get those answers. It is unlikely that those answers will come from the sociopath, as how could you believe anything that came out of his mouth anyway? There is only one answer to why…. and that is, that this person is a person with a disordered mind. It has no reflection on you at all. It is a reflection on him. You will gain answers in other ways, by learning about the disorder, and if you talk to other people who have been involved with a sociopath, you will realise that every sociopath does the same thing. Every narcissist does the same thing. If you read about sociopathy, you will realise that whilst your experience was not a normal experience for you. The behaviour is normal for sociopaths and narcissists. By learning and understanding, the more that you read, the more that you learn, the quicker you come out of the fog of confusion and begin to heal. You can start to let go. The psychological damage to you, is your problem and you might feel bitter and angry. But anger and bitterness does not last forever. Neither does confusion. This is a poem that I found on the internet, by Lucy Gossen. It was before I discovered that he was not only a compulsive pathological liar, but a sociopath. It makes sense. Never once have you said anything other than anything deceitful. Consuming all around you and so relentlessly receptive. While all around you are but pawn’s for your own use. In reality I watch as your psychosis gradually worsens. Behind closed doors and cold surfaces I watch you shift the blame. Never once have you been genuine, never let down your guard. I have the ability to love and to care, the ability to feel. And by default I am everything you’re not; I’ll always be the winner. Lucy wrote this poem about a compulsive liar. But it describes a sociopath perfectly. YOU have the ability to love and to feel. and unfortunately he does not. And he never will. You will go on to have happy and healthy relationships. This is something that he will never master. You are free, seek out information about narcissism, sociopaths, psychopaths. The more you read, the more you understand, the more you will see that this was never YOU. The only answer that there is, is this is a personality disorder. Something within him. Not you. You are free. You are free to go onto live your life. Your pain will not last forever. Read the post about recovery from a sociopath. Follow the steps to heal and recover. Take care of you. Learn what you can as those answers, will be far more reliable than any offered by a compulsive pathological liar. When I first realized I was pry to him, I felt stupid. I felt stupid that I had taken him back so many times, even after being cheated on, lied to, and anything else he could come up with. I hated being around his friends because I felt that they all knew. We’ve all known that one person that continually goes back to their horrible relationship and I hated the idea of people thinking of me like that. I had always prided myself in being able to walk away from relationships that were not in my best interest. I was a smart, savy, in control woman. I thought all his ex girlfriends were weak in nature and that’s why he chose them. However, I didn’t see those things in myself. The same weaknesses they had were also my own. What a learning experience! I now realize that I’m not weak, the other women are not weak. No matter how strong you are, there is no escape from someone who manipulates themselves, and you, into thinking they are everything you’ve ever wanted and needed. I don’t feel shame anymore. Why me? It had nothing to do with ME, I just happened to be next in line. It isn’t that you are stupid. More that he is more experienced at being deceptive than you are at being paranoid and thinking that this type of behaviour exists. You have a conscience – he has none. Therefore he just doesn’t care. To him it’s business. You are right – you are not weak…. they are just expert manipulators and predatory people. I can not help comparing myself to the person the ex sociopath in my life chose to be with. According to her ‘they are happy’. I know it is terrible to say and this makes me a horrible person but I am waiting for the relationship to end (if he gets bored) so she feels the lie’s and pain my daughter and I feel and his pattern reiterates his inability to care. Additionally my daughter and I are sick of being judged by his family and looked upon like we are nothing but dirt, we embraced them, loved them. Can they not see what he does? My husband is involved with a sociopath that has stooped to the lowest of lows to keep him entwined all the while getting what she needs and wants, to have her legal fees paid for in her custody battle with a man she has drug through the mud for 7 years and places to live and whatever else she can get. After nearly 3 years of off and on tumultuous relationship with this woman, she finally got him to leave our home in hopes of getting me to stop exposing her. She twists and manipulates and actually deflects herself onto me. She has said and done some pretty disgusting things to our children and not once has he stuck up for us because he believes she is something. She has been to prison, is a lifelong alcoholic (along with her family) is a drug addict, moves constantly because men would stop paying and she gets evicted or finds a new victim. She has no job and tries to portray herself as high society. My husband owns his own business, highly regarded until she came along (thats how they met, came in as a temporary secretary) , we had an upstanding family, active in the church and the community with 4 great, active children who go to private school. We can all do the math here and I just can not get him to see. He actually had her move into a house we owned right next to our business in the middle of town and one can only imagine what the neighbors witnessed. She lived there for a little over 2 years almost 1 1/2 years after I got her to quit the job at our business when the police had to come remove her. She would actually drink all day on the job, straight vodka, in a business that deals with families everyday. I hope my husband can figure it out before he hits rock bottom!!! Faith, why are you coping with your husband treating you with such little respect? You say that she is a sociopath… (she might be I don’t know) but he doesn’t sound too hot either. You say that she rented this house for two years, so he has been cheating on you for years. You deserve so much more than this. HE is the one that took the time to tailor himself to exactly what “we” need, yet “we” are the ones who are left inconsolable, confused, distraught. I think we need to change that negative thinking around, and look at it positively – that we were/are THAT worthy of someone totally transforming themselves! Yes, its a con. Yes, we were deceived. But we never really change the core of who we are: our values, morals, integrity, passion in life….yet these sick individuals spend their entire lives reinventing themselves while we are already established in our own rights. We should be celebrating! Although weathered from this storm, we still have our values, morals, integrity…but they have to start all over again in their vicious cycle.